At our office, we believe in dreams. Truly. We trust, deep down in our core, that all dreams, whether big or small, are important and have a place in the world. And that is precisely why we thought it necessary to offer you this bright, whimsical wig! 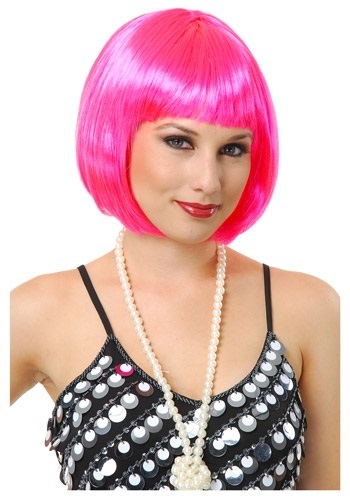 This Short Bob Hot Pink Wig is for all of the people out there, like you, who dream of having that perfect, classic flapper hairdo in a modern neon hue--like hot pink. We know, we know...it is a very specific and strange dream to have. But hey, no judgment from us. We think strange is good. You should hear some of our dreams...one guy down in finance had a dream of first becoming a business tycoon, then a reality star, than the President! Wacky, right? So, don’t worry. We got you covered with this cool, chic wig! Love the color, length, and the hair doesn’t fall off too easily. Great buy!